Spend two hours strolling the historic streets of the Holy City with your friendly and professional guide. Travel back in time and learn about the culture and traditions of this iconic coastal town. You'll encounter friendly locals, see top-rated sites and enjoy the true southern charm of this popular travel destination. Lots of walking but very enjoyable fact filled. Our guide and his assistant were outstanding. The architecture varied with each block. I will recommend this tour to my friends and family. Jini was very interesting and informative! Our group enjoyed approximately 2.5 hours of walking through historical parks, landmarks, and buildings. She had great recommendations for what to do in Charleston. Not too much walking at all. Highly recommend! Barry did a wonderful job. His knowledge of the history and town made the tour very interesting. I would definitely take another tour with this group. Excellent history lesson was presented by Barry, our guide on the 2 hour walking tour. He immediately made us feel as a group. He was interesting, funny and imparted so much information on the history of buildings, architecture and people of Charleston. It was an excellent way to begin our visit to this terrific city. We will be back soon. Amazing tour full of fun facts and history. Suggest doing early on in stay as based next couple of days activities on info received during tour. Easy walk! Jeni was knowledgeable and helpful. Since it was raining, she let us know where to purchase an umbrella, and even provided an extra one she had for another couple. Jeni provided additional background information, and offered some good suggestions for lunch. We had a great time and our tour guide gave us great information along with a few jokes hear and there. 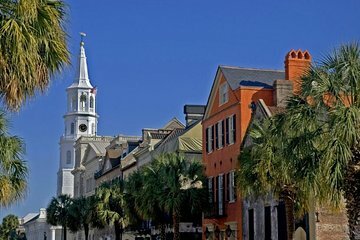 We would recommend this tour to anyone looking to get a little exercise along with learning about the history of Charleston. Learned a lot about Charleston and got some exercise too! The guide was fantastic. Very knowledgeable and entertaining! I really feel like you get so much more out of a trip when you have someone who knows the history of the city and is able to point things out and share information. I do not recommend this tour company at all. Use other tour companies that really care about their customers even after youve paid for the tour! I bought a 9:45am 2-hr walking tour with them and by 9:30am I already know Ill be late by 5 mins. I called them several times using the number on the voucher. The number seems to be their office number I checked their site and they are open on Sunday but no one is answering. The voicemail said they will call back in an hour but there was no callback. There is no excuse for being late but they should have called me to check if Ill make it to the tour. Im not expecting them to wait for me but I could have met up with them on their 1st or 2nd stop. They dont care since Ive paid for it already. I had 2 other walking tours with two different companies on that same day and there were a couple of people who were late but both tour guides called these people to check if they were coming. One of them said he is not coming and the other said shell be there in two minutes so we waited.